Here's a fun and simple Christmas card I did using Echo Park's Holly Jolly collection. 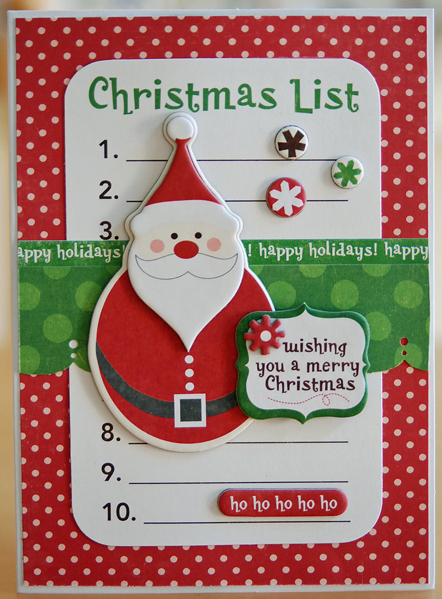 This card appeared in the December issue of CARDS magazine. Isn't that chipboard Santa the cutest? OMYGOSH!! This is ADORABLE!!! I loveeeeeeeeeeee that Santa!!!!! Happy New Year!! This is absolutely adorable. I love the fun santa and how crisp it all it. Super Cute Lisa. happy New Year to you!!! Such a cute card, Lisa!! Happy New Year!! Darling card! Happy New Year! Soooo super cute! Love your card. Congrats on the pub! What an adorable Santa, cute card! Oh my gosh that is the cutest card!! I love it!